In our series of analyzing knowledge about knowledge, we’ve previously talked about scoring patterns in the Science and Sports categories of Trivia Crack. Today we’ll move on to Part 3, where we examine my personal favorite, Geography. Like both of the previous categories, half of all Trivia Crack players have a score of 72 or higher in Geography. But again, we see a different pattern around that median. Relatively few people are particularly weak at Geography and a lot of people are pretty darn good. You need an 83 to break into the top 10 percent of scores and an 88 to be in the top 1 percent. So with Geography we have a new type of category, one where a lot of people are pretty strong and relative few who struggle. That produces a different profile of rankings. As seen below, Geography is very seldom a player’s weakest category or even second-weakest. And while it’s not disproportionately likely to be a player’s top category, there’s a good chance that it’s in their top three. When you average all of this out, Geography is the highest-ranked category for players. If you’re good at Geography, does that predict that you’re a good overall player? And if you’re weak at Geography, are there other categories where you’re strong or weak? We did a correlation to test that analysis. We won’t reveal our analysis of total scores until later – you know, to build up suspense – but we can look at correlations. First off, we should note that there’s a strong correlation between every category and total score. We would expect that, because your total score is just the sum of all of your individual category scores. 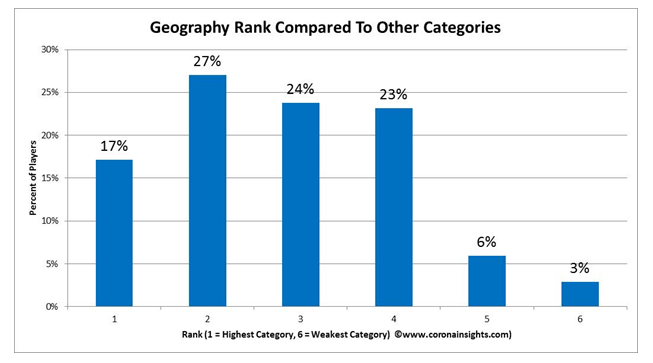 However, there’s a stronger correlation in some categories than others, and Geography is the most powerful as a predictor of overall score. If you want to predict a person’s overall rating, the best question to ask them is their Geography score. It has a very strong Correlation factor of 0.939, where 0 means no relationship at all and 1 means that it’s a perfect predictor. That’s uncannily high; perhaps a knowledge of Geography is an indicator of well-rounded knowledge? And what category most closely aligns with Geography? Another simple correlation analysis shows that the scores that run most closely in parallel to Geography scoring is History scoring. Perhaps one can’t really understand history without knowing geography, but in contrast one can know geography quite well while not knowing the latest Taylor Swift album. 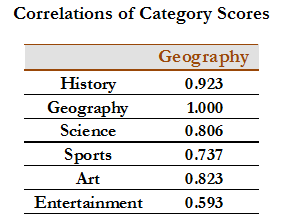 Geography scoring correlates much lower with entertainment than any other category. 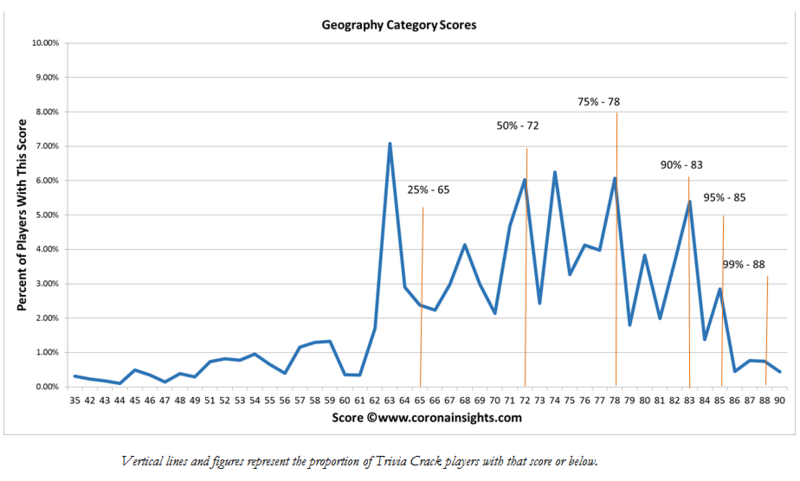 If you’d like to know exactly where you stand on Geography, here’s a chart that estimates the proportion of players who score at or above a particular score, based on our modeling. Don’t forget to check out the next post, where Kevin explains how we’ve developed our estimates.